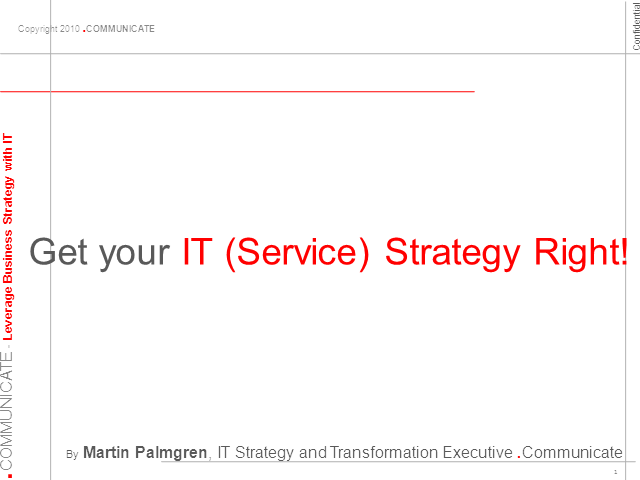 What has strategy execution, got to do with certification lighthouses such as ITIL, VALIT, COBIT, RISKIT, CMMI, TOGAF, ISO 9000, 20 000, 27 001? Martin Palmgren will discuss how these certifications can work alongside; stakeholder priorities, time to market, business drivers, cost effectiveness & cycle time, total cost of ownership (TCO), cost, consumption, chargeback, a business (IT) model and value proposition, as well as demand and cost drivers. He will also pose the question how effective is your business (IT) model? Sharing his experiences where IT has perceived to fail to meet business expectations and how to overcome this by optimizing your IT business model.